Foxboro, 12 vs. Blue Hills, 0 – Final (4 inn.) – Foxboro’s offense exploded for nine runs in the bottom of the first inning, helping the Warriors win big in a mercy-rule shortened contest. The Warriors totaled 12 hits in the contest with senior Brian Duncan leading the way with three hits (one double) and two runs scored. Junior Kyle McGinnis added two doubles and two runs scored and junior James Kaeser had two hits, a run, and two RBI for the Warriors. Michael Develin and Joe Cavaleri each had a double and knocked in a pair of runs in the win. Sophomore Cam Prescott earned the win, allowing just one hit in four innings of work while striking out two. Foxboro will take on Milton in the championship game of the third annual Steven J. Sullivan tournament on Thursday at 2:00. Franklin, 12 @ Catholic Memorial, 1 – Final – Franklin’s offense plated six runs in the top of the fifth inning, turning a 6-1 lead into a 12-1 win on the road at Catholic Memorial. Senior Scott Elliott blasted a three-run home run to pace the offense while senior Alex Haba went 3-for-4 with a pair of runs scored. Joe Lizotte (three RBI, run), Shane O’Neil (run, RBI), JB Floris (double, two runs, two RBI), and Jack Nally (run, RBI) each had a pair of hits for the Panthers. Junior Brennan Rivera tossed a complete game, allowing just one unearned run on two hits and two walks while striking out six to get the win. North Attleboro, 10 vs. Somerset Berkley, 1 – Final – North Attleboro burst into the win column behind a strong team offensive performance and a stellar showing on the mound from sophomore Dennis Colleran. The Rocketeers, who trailed 1-0 early, tied the game with a run in the second, plated five runs in the third (all with two outs), tacked on one run in the fourth, and put the game out of reach with three more in the sixth. Colleran allowed just two hits in a complete game effort, striking out seven with no earned runs allowed. Russell Dunlap (four RBI) had a bases-clearing triple with two outs in the third to help the Rocketeers create separation. Jake Palmer led off the fourth with a single and eventually scored on a wild pitch to make it 7-1. Jake Carroll added an RBI single in a three-run sixth. Sophomore Jared Penta added two hits in the win. Oliver Ames, 5 vs. Dighton-Rehoboth, 3 – Final – With the game tied at 3-3, Oliver Ames senior Matt McCormick delivered a two-run single to put the Tigers ahead for good. Senior Reid Latham earned his third win of the season, striking out eight and walking in two with two earned runs allowed in six innings of work. Senior Tyler Avery recorded the save, pitching out of a bases-loaded jam in the seventh inning to secure the win. Jake Erlich went 2-for-3 while Cam Perron and CJ Deveau each had a hit and an RBI. Chris Pearsons added three hits, two runs scored, an RBI and was strong in the field defensively, including turning a key double play. Stoughton, 7 @ Brockton, 6 – Final – For the second time this season, Stoughton junior Jacob Kaplan has delivered a big hit with the bases loaded. After helping the Black Knights beat North in the season opener with a big hit, Kaplan was at it again on Tuesday. This time, with Stoughton holding a 2-1 lead, Kaplan cleared the bases with a two-out double in the top of the fifth and later scored himself to give the visitors a 6-1 advantage. Brockton cut the deficit to one with a four-run fifth, and the teams traded runs in the sixth to make it 7-6. Sophomore Brady Conlin earned the two-inning save with no hits allowed and one strikeout. Senior Evan Jackman picked up the win, scattering seven hits and three walks in five innings of work, striking out two. Mansfield, 12 vs. Duxbury, 5 – Final – Mansfield pounded out 14 hits in total and scored four runs in each the fourth and sixth innings to earn a win over visiting Duxbury. Mady Bendanillo got the offense started with a home run in the bottom of the first and was a part of the Hornets’ two-out three-run rally in the third. Megan Letendre singled, Mady Bendanillo (two hits) walked, and Mary Muldoon, Caty DeMassi (two hits), and Ella Verheggen (two hits) each had RBI singles. Kara Bendanillo, Casey Mousette, and Sydney Woods also had two hits for Mansfield. Sarah Cahill allowed five hits while striking out seven. North Attleboro, 7 vs. Dartmouth, 3 – Final – North Attleboro prevailed in a battle of unbeatens, handing Dartmouth its first loss with a 7-3 verdict. Junior Bella Erti struck out eight without issuing a walk, scattering six hits in a complete game. Erti did not allow any earned runs in the win. Sophomore Emily Nardelli had two hits, a sacrifice fly, and a walk, junior Ashley Cangiano added a triple, and freshman Mandi Hanewich had a single and a run scored. Junior Annabelle Hebard, junior Abby Gallagher, and sophomore Belle Clarkin each had two walks and a run scored. Oliver Ames, 8 vs. Whitman-Hanson, 7 – Final – Click here for a recap and photo gallery from this game. 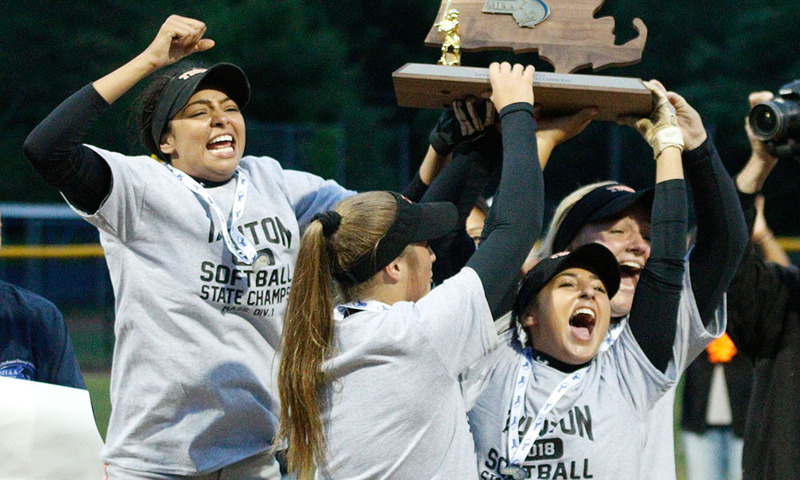 Stoughton, 5 vs. Brockton, 4 – Final – Stoughton sophomore Nicole Baker hit a walkoff solo home run in the bottom of the seventh inning to cap the Black Knights’ comeback against Brockton. The Boxers held a 4-3 lead entering the bottom of the sixth but senior Karly Estremera (two hits) delivered a two-out double to score Sarah McGrath to tie it 4-4. After Baker shut the Boxers down in the top of the seventh from the circle, she gave Stoughton the win with her home run. Senior Brianna Ferrandiz went 2-for-3, junior Lexi Baptista added a double, and freshmen Melody Casna and Sydney Menz each had a hit. Baker earned the win in the circle, striking out 12. Foxboro, 13 vs. Hanover, 7 – Final – Foxboro held a three-goal advantage at half and entering the final period but the Warriors were able to pull away to get the win over Hanover in Chowda Cup competition. The Warriors led 6-3 at the break, and 9-6 going into the fourth. Foxboro outscored the Indians, 4-1 in the final frame. Brendan Tully had four goals and one assist, Bobby Yerardi added four goals, and Shayne Kerrigan netted a hat trick and added one helper. Pete Conley and Charlie Baughan each scored once for the Warriors, who will take on Marshfield on Thursday at 12:00 at Westwood High. Mansfield, 3 @ Marshfield, 16 – Final – Mansfield trailed by just two after the first quarter and at half but couldn’t keep pace with the Rams in the second half. Connor Quirk and Jake Quirk each scored in the second quarter, helping the Hornets stay within two at half (down 4-2). Jake Quirk added a second goal in the second half for Mansfield, who will play Hanover on Thursday at 10:00AM at Westwood High. Milford @ Dighton-Rehoboth – Postponed to a date and time to be announced. North Attleboro @ Silver Lake – Postponed to Wednesday, 4/17 at 4:00. Oliver Ames, 19 vs. Norton, 4 – Final – Seven different Tigers found the back of the net as Oliver Ames improved to 5-0 with a win over visiting Norton. Junior Frankie Ireland had two goals and five assists, sophomore Remi Creighton added two goals and three assists, and sophomore Ross Carroll recorded a hat trick in his varsity game. Sharon, 14 vs. Cardinal Spellman, 3 – Final – Sharon senior Emma Eberhardt and sophomore Jenna Goldstein combined for nine goals as the Eagles rolled to a win over visiting Cardinal Spellman. Goldstein netted a team-high five goals while Eberhardt finished with four tallies. Mia Lappen and Cass Barbera each had two goals, and Bridget McManus scored once. King Philip, 3 @ Dighton-Rehoboth, 0 – Final – King Philip went on the road and earned its sixth straight win, sweeping D-R (25-18, 25-12, 25-23). Senior Billy Hughes and senior Max Armour both had strong games for KP, with Hughes recording five digs, three kills, and two blocks while Armour added seven kills and six digs. Junior Kyle Desrochers anchored the defense with nine digs while senior Eric Altobello finished with eight kills. King Philip, 7 @ Bishop Feehan, 9 – Final – Tim Crowley and Zack Zarba each had a pair of hits and drove in a run for the Warriors but King Philip fell on the road to Feehan. Mansfield, 3 vs. Braintree, 1 – Final – Mansfield senior Kyle Moran had a no-hitter through 6.2 innings, leading the Hornets to a win over visiting Braintree. Moran (five walks) struck out 10 in a complete game, not allowing the Wamps a hit until the seventh inning. Offensively, the Hornets took a 1-0 lead in the bottom of the seventh and then added two more in the third. Sam Nugent went 2-for-4 with two runs scored, Eric Longley had a pair of RBI doubles, and John Carney added two hits and a run scored. Milford, 10 @ Hopedale, 0 – Final – Milford’s offense came alive, plating 10 runs in a win over non-league rival Hopedale. Luke Rosa paced the offense with a pair of hits, including a home run, two RBI, two runs, and a walk. Dan Corsini (2-for-3) added an RBI and a run scored and Carter Scudo had a hit, a walk, two stolen bases, and two runs. Colby Pires got the win, tossing four scoreless innings allowing just one hit while striking out three. Sophomore Mario Lee pitched two scoreless innings in relief with four strikeouts. North Attleboro, 6 vs. Natick, 8 – Final – North Attleboro answered each time that Natick scored, but couldn’t keep pace as the RedHawks picked up a win on the road. Natick went ahead with a three-run home run in the top of the first but North got on the board in the bottom of the first on an RBI single from Jake Palmer. Natick extended the lead to 5-1 in the top of the fifth but North made it a one-run game by plating three in the bottom half. Ryan Warren (two hits) led off with a hit and scored on another RBI from Palmer, who scored on a fielders’ choice from Dennis Colleran (3 RBI). Kyle Briere scored on a single from Jake Carroll to make it a one-run game. Natick padded its lead with three runs in the top of the seventh. Colleran belted a two-run home run in the bottom of the seventh. Oliver Ames, 2 vs. Walpole, 10 – Final – Oliver Ames kept pace with the Rebels for five innings before the visitors pulled away with six runs over the final two innings. Sophomores Emma Varella (2-for-3, double) and Grace Simone each scored a run for the Tigers while Katie Abreu added a hit. Stoughton, 13 vs. Milton, 0 – Final (6 inn.) – Nicole Baker had another impressive start for the Black Knights, striking out 10 and allowing only three hits to earn the win. She also had a pair of hits at the plate. Karly Estremera led the Stoughton offense with four hits, while Lexi Baptista and Nikki Coppola both added two hits apiece. Mansfield, 16 @ Sharon, 0 – Final (5 inn.) – Mansfield jumped out to a big lead, with 10 runs in the opening two innings, and never looked back to pick up the road win. The Hornets scored seven runs in the first on seven singles, added three runs in the second inning and then tacked on five more in the fifth. Mansfield finished with 16 hits as a team. Ella Verheggen went 3-for-4 with four RBI, while Kara Bendanillo, Mady Bendanillo, Mary Muldoon, Caty DeMassi, and Sarah Cahill each recorded two hits apiece. Cahill also earned the win in the circle, striking out six and facing just two batters over the minimum. Canton, 9 @ Scituate, 7 – Final – Tied at four apiece at halftime, Canton outscored the Sailors 3-2 in the third to take a lead into the fourth, and the Bulldogs limited Scituate to just one goal in the final frame to get the win. Senior Griffin Roach led the way with three goals and three assists while Dylan Coyne had a strong game in net with seven games. Head coach Bill Bendell noted the strong defensive efforts of Brendan Albert, James Murphy, George Kent, Nick Mackay, Jack Albert, and Carson Campbell. King Philip, 4 @ Bishop Feehan, 1 – Final – King Philip won two matches in singles action and swept both doubles matches to earn a victory over Bishop Feehan. Sophomore Nick Putney didn’t drop a game in a 6-0, 6-0 win at second singles while junior Jack Cannon secured a 6-1, 6-1 win at third singles. The team of Nate Ihley and Tyler Dowd picked up a 6-2, 6-1 win at first doubles while Jake Mager and Max Goreham rallied for a 6-7 (5), 6-1, 6-3 win at second doubles. King Philip, 3 vs. Millis, 0 – Final – King Philip won its fifth straight match with a 3-0 sweep (25-13, 25-17, 25-15) at home against Millis. Alex Bernhard had a strong day with 13 service points and one ace while Mike O’Brien paced the offense with 10 kills. Foxboro, 4 @ Mansfield, 8 – Final – Mansfield broke the game open with a four-run sixth inning, which included a Mady Bendanillo homer and a triple from Sarah Cahill, to open the season with a win. Cahill, Bendanillo, and freshman Casey Mousette each went 2-for-3 in the game for the Hornets. Foxboro scored in the top of the first but the Hornets answered right back in the bottom half. Kara Bendanillo started it with a single, Ella Verheggen reached on an error, Mady Bendanillo walked and Mousette opened her varsity account with a two-out, RBI-single. Mousette got her second hit of the game to start a rally in the fourth. Sydney Woods followed with a walk and Cahill’s single brought in one while Woods came around when the throw got away. The Hornets added one in the fifth and then four in the sixth. They had 10 hits as a team and Cahill struck out five to pick up her first win of the season. Stoughton, 12 @ Oliver Ames, 1 – Final – Stoughton’s offense exploded for seven runs in the seventh inning to pull away from the Tigers. Nicole Baker allowed only four hits and struck out eight to open the season with a complete game victory. Baker also paced the Black Knights at the plate, going 5-for-5 with three singles, a double, a grand slam, and six RBI. Lexi Baptista went 3-for-4 with a triple and two singles and Karly Estremera, Sarah McGrath, Jordan Lyons, and Brianna Ferrandiz all had two hits for Stoughton, while head coach Deb Parker saidSydney Menz and Estremera both made big plays in the field. OA senior Kayla Georgeu struck out seven in six innings of work while freshman Bella Berg fanned two in one inning. Junior Katie Abreu went 3-for-4 with a run scored for the Tigers. King Philip, 16 vs. Shepherd Hill, 3 – Final – King Philip senior Colin DeVellis scored six goals and had one assist as the Warriors opened the season in style, running away with a win over Shepherd Hill. Andrew Sajdak and Sam Mattson each finished with three goals and two assists, Luke D’Amico scored once, and senior Paul Williamson and sophomore Charlie Agricola each netted their first varsity goals. Oliver Ames, 14 vs. Bellingham, 8 – Final – Oliver Ames opened its season by defending home turf, picking up a victory over visiting Bellingham. Shane Kilkelly had two assists and scored three goals, joining the 100 goal club. Sam Stevens paced the offense with five goals and two assists while Colin Bourne had a strong day, finishing with four goals and one helper. Canton, 1 @ Attleboro, 4 – Final – Attleboro swept doubles play and earned two more wins in singles action to secure a 4-1 win over visiting Canton. Jared Cooper earned a 7-5, 7-5 win at second singles while Ryan Gordon grinded out a 7-6 (9-7), 1-6, 6-3 victory at third singles. Attleboro’s team of Eli Araujo and Luis Sandoval lost just one game in a 6-1, 6-0 win while Jack O’Donnell and Chris Beard secured a 6-1, 6-1 win at second doubles for the Bombardiers. Canton’s Suraj Ramanathan won 2-6, 6-3, 6-4 at first singles. Foxboro, 3 @ Mansfield, 2 – Final – Foxboro picked up wins at second and third singles as well as first doubles to edge Mansfield. Sophomore Jason Kandula won 6-3, 6-0 at second singles while freshman Bo Canfield earned a 6-4, 6-4 victory at third singles. The team of senior Brian Gardner and junior Sean McAvoy secured the win with a tight 7-5, 7-6 (5) win at first doubles. Mansfield senior Luke Nickerson won 6-0, 6-0 at first singles and the team of Dheeraj Valluru and Yash Sakhalkar earned a 6-4, 6-1 decision at second doubles for the Hornets. Milford, 0 @ Franklin, 5 – Final – Franklin had an impressive win to open the 2019 season, winning four out of the five matches in straight sets. Liam Marr didn’t lose a game in a 6-0, 6-0 win at first singles, Rohan Herur won 6-0, 6-2 at second singles, and Saket Gandham picked a 4-7, 6-4, 8-6 victory at third singles. The team of Saketh Saripalli and Vayshnav Malhotra won 6-3, 6-0 at first doubles while Shoyaib Shaik and Shournik Sompally won 6-0, 6-1 at second doubles for Franklin. North Attleboro, 5 @ Taunton, 0 – Final – North Attleboro went on the road and swept Taunton, losing a total of just two games in doubles play. Sophomore Jonah Manso didn’t drop a game in a straight set 6-0, 6-0 win at first singles, sophomore Sam Gallagher picked up a 6-2, 6-2 win at second singles, and junior Justin Strom emerged with a 6-4, 6-3 decision at third singles. The team of Vikram Senthilakumaran and Alex Pfeffer won 6-0, 6-1 at first doubles and seniors Tomas Bentley and Saketh Uppuluri won 6-0, 6-1 at second doubles. Stoughton, 5 @ Oliver Ames, 0 – Final – Stoughton notched a win on the road over neighboring Oliver Ames to begin the 2019 season. Sophomore Waseem Sablon won 6-0, 6-0 at first singles, senior Erik Anderson picked up a 6-1, 6-0 win at second singles, and Anish Sinha secured a 6-3, 5-7, 6-3 win at third singles. The team of seniors Hassan Khan and LJ Ferrandiz won 6-0, 6-1 at first doubles for the Black Knights. Sharon, 3 @ King Philip, 2 – Final – Click here for a photo gallery of this game – After two and a half hours, Sharon senior DanDanujan Thirumavalavan emerged with a 1-6, 6-3, 6-2 win at first singles to give Sharon the deciding point in its 3-2 victory over King Philip. Freshman Bueman Bhattacharya won his first match, 6-1, 6-0 at third singles while the team of junior Jake Ross and freshman Max Chen won 7-6 (9-7), 6-4 in a close match at second doubles. King Philip’s Nick Putney won 6-1, 6-2 at second singles and the team of juniors Jack Cannon and Nate Ihley earned a 6-0, 6-0 decision at first doubles. Attleboro, 0 @ Canton, 5 – Final – Canton defended home court with a 5-0 win over visiting Attleboro. Rachel Kupferman had a strong opening match, winning 6-0, 6-0 at first singles, Natalie Keppler picked up a 6-2, 6-0 victory at second singles, and Sarah Hernandez won 3-0 (injury) at third singles. Canton’s Stelina Michaelidis and Jamie Cree had a 3-6, 6-1, 6-1 comeback win at first doubles and Sophie Le and Rose Hazam won a tight 7-5, 6-4 match at second doubles. Mansfield, 0 @ Foxboro, 5 – Final – Foxboro won all five matches in straight sets to get a win to begin the 2019 season. Pam Nelson won 6-0, 6-1 at first singles, Sarah Prag notched a 6-2, 6-0 victory at second singles, and Julia Muise didn’t drop a game in a 6-0, 6-0 win at third singles. Foxboro’s first doubles team of Kendall Milender and Paige Krockta earned a 6-2, 6-2 win while Maggie McAuliffe and Lindsey Young secured a 6-4, 6-3 decision at second doubles. Franklin, 3 @ Milford, 2 – Final – Franklin swept doubles play, winning both by tiebreaker, and got another win in singles to get a 3-2 decision over Milford. The team of Ashvika Boopathy and Vagmi Kantheti won 6-4, 7-6 (7-1), 10-6 at first doubles while Tessa Cacioppo and Krissy Stoyanova picked up a 6-2, 7-6 (7-3) win at second doubles. Frankin’s Sarah Schiavo won 6-3, 6-4 at first singles for the third point. Milford’s Juliana France won 6-3, 6-1 at second singles while Olivia Marshall notched a 6-4, 6-3 victory at third singles for the Scarlet Hawks. Taunton, 4 @ North Attleboro, 1 – Final – Taunton moved to 2-0 on the young season, earning its first league win of the season on the road at North Attleboro. Jillian Pagliuca earned a 6-0, 6-1 win at first singles, McKenzie Lucie won 7-6 (7-3), 6-2 at second singles, and Jocelyn Pagliuca picked up a 6-0, 6-1 win at third singles. The team of Sam Martin and Briana Fevrier won 6-4, 6-4 at first doubles for the Tigers. North Attleboro’s Hayley Strom and Brototi Nandi won 6-1, 6-4 at second doubles. Oliver Ames, 5 @ Stoughton, 0 – Final – Oliver Ames went on the road and picked up a win over Stoughton to open its 2019 campaign. Senior Sarah Leger (6-1, 6-2, first singles) and junior Maura Kiernan (6-1, 6-0, second singles) each won in straight sets while sophomore Kate McCormick secured a 2-6, 6-4, 6-3 win at third singles. The team of senior Eva Belanger and junior Erika Mekler picked up a 6-2, 6-0 decision at first doubles while junior Sarah Barron and senior Kathryn McCarthy won 6-3, 6-2 at second doubles for the Tigers. King Philip, 1 vs. Medfield, 3 – Final – Click here for a photo gallery of this game – King Philip started its first ever varsity game by winning the first set but Medfield won three straight close games to take the match, 3-1 (20-25, 25-23, 26-24, 25-22). Junior Eric Altobello had a team-high 13 kills, senior Jimmy Peterson added eight kills, and junior libero Kyle Desrochers had five aces and seven digs for KP. Taunton, 3 vs. Barnstable, 0 – Final – Taunton broke into the win column with a sweep over visiting Barnstable (25-18, 25-23, 25-18). Sophomore Tyler Stewart led the offense with eight kills and three blocks, Gage Kingman added five kills and two aces, and Alex Tavares and Liam Bunker each finished with three kills and three blocks. MANSFIELD, Mass. 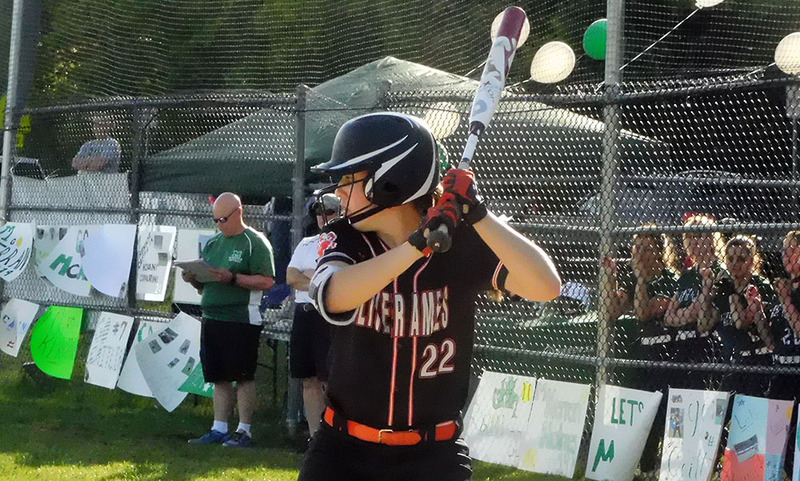 – The Oliver Ames softball team outlasted the Mansfield Hornets in an offensive showdown Monday afternoon at the East Street Fields. Most of the Tiger runs came during an offensive burst in the top of the fourth, where they put up six runs and batted through the lineup. The Hornets a six-run inning of their own in the sixth inning, but the Tigers added on two insurance runs in the seventh to get the win. On the mound, OA freshman pitcher Emma Varella tossed 5.2 innings, giving up four runs and on six hits and seven walks while striking out three for the win. In relief, senior Lexie Campbell moved over from second and gave up a run and two hits in 1.1 innings. Oliver Ames broke through first in the top of the second, as a walk to sophomore shortstop Katie Abreu was turned into a run by a single to left from senior third baseman Rachel Han two at-bats later to give the visitors the run advantage. The game remained much of a pitcher’s duel up until the top of the fourth when the Tiger offense roared to life as seven straight batters made it on base. A leadoff single by senior designated hitter Caroline Mahoney was followed by a walk to junior first baseman Katie Mills and a single by Abreu loaded up the bases for Oliver Ames. A walk to senior right fielder Sarah Tetrault drove in Mahoney to make it 2-0, and Han drove in Mills for her second RBI of the afternoon. With the bases still loaded and no outs, Allison called on junior Kayla Georgeu to pinch hit. “[Georgeu] has a serious power stick, so I can always count on her to swing for the fences almost every time she’s up there,” Allison said. Her decision was proven right as the junior sent a shot into deep left field, clearing the bases with a three-run triple and doubling her team’s lead. Senior catcher Antonia Peretti drove Georgeu home on a single in the next at-bat, extending the lead to 7-0. The scoreline remained the same until the bottom of the sixth when Mansfield staged a comeback effort with a six-run inning of their own. Junior third baseman Kara Bendanillo and junior second baseman Megan Letendre drew back-to-back two-out walks and the pair advanced into scoring position on a couple of wild pitches. With two outs, junior catcher Caty DeMassi drove in the pair of juniors for the first two Hornet runs and would come home herself via a single by infielder Grace Benton to make it 7-3. After Sarah Cahill walked, a single down the right-field line from Felicity McMullin allowed Benton and Cahill to score, bringing the hosts within two. Varella, who was coming off 10 innings of work in her previous outing, was replaced by Campbell, and after McMullin came home through a wild pitch and a throwing error to first , the inning ended with the Hornets trailing the Tigers by just a run, 7-6, with another inning left to play. The Tigers, however, were quick to respond as Mahoney, Mills, and Abreu all singled to start off the inning. While OA grounded into a double play at first that denied a run at the plate, Han hit a double into deep left field to bring in Mills and Abreu for two more runs, and the Tigers headed into the bottom half of the inning with a three-run advantage. Kara Bendanillo lead off the bottom half for Mansfield with an infield single and may have very well scored off Letendre’s gap shot the next at-bat had it not been grabbed in a diving catch by senior center fielder Marissa Guarino. Junior center fielder Mady Bendanillo drove her in off a single, but the Hornets comeback effort would fall short as Campbell sealed the deal for the Tigers. Though her team is out of tournament contention, Allison felt the win was still very important to the team overall. Oliver Ames (2-12 Hockomock, 2-16 overall) returns to action Tuesday as they host Kelley-Rex co-leaders Taunton while Mansfield (3-12 Hockomock, 5-12 overall) travels to Duxbury Wednesday for a non-league outing against the Dragons. Franklin, 0 @ North Attleboro, 1 – Final – Annabelle Hebard plated the game’s only run with a sixth-inning single to lift North Attleboro to the win in a rapidly played game. Ashley Cangiano reached on an error with one out in the sixth and Bella Erti followed with a double to move runners into scoring position before Hebard provided the clutch hit. Hebard had three hits for North and Abby Gallagher and Emily Nardelli each had one. Erti tossed a two-hitter, walking just one and striking out four, and got some help in the seventh with a nice catch by Emily Pastore. Jackie Cherry and Maddy White each had a hit for Franklin while Emily Valentino allowed six hits and struck out five for the Panthers.